The state of Pennsylvania has joined the growing list of supporters for the hyperloop. In fact, a Lehigh Valley resident is taking a big role in hyping this transportation innovation. Simply put, the Hyperloop One is being touted as a potential landmark breakthrough in transportation technology. Ryan Kelly, a 2004 graduate of Bethlehem Catholic High School and also a former Bath resident, is currently the head of global marketing and communications for Virgin Hyperloop One. It’s the first company worldwide that has essentially built a test tube to showcase this ultra-fast mode of transportation. For Kelly the unequivocal answer is the hyperloop technology. Elon Musk was the first to talk about this groundbreaking concept back in 2013. Basically, the concept melds the technology of vacuum tubes and high speed trains. Ultimately, this creates a land-based travel system that can attain speeds of up to 670 miles per hour. The Hyperloop One concept calls for bus-sized pods able to carry up to 40 passengers at a time. These pods would, for instance, let a person from Western Pennsylvania commute to Philadelphia in about 30 minutes. Then, if linked with another potential hyperloop between Chicago to Pittsburgh, a commuter could go from Philadelphia to Chi-Town in just one hour and fifteen minutes. Put succinctly by Kelly, “We can travel the speed of flight at closer to the cost of trucking.” Speaking of speed, movement on the potential hyperloop is accelerating fast. In fact, the Pennsylvania Turnpike Commission is partnering with PennDot to conduct a feasibility study on the project. Potential stops for the hyperloop in Pennsylvania could include Harrisburg, Pittsburgh, Wilkes-Barre, and Scranton. When is the Technology Arriving? 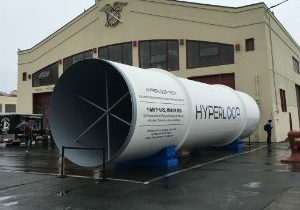 The hyperloop project is gaining momentum but is still down the line. In fact, the feasibility study isn’t even due until the middle of 2020. Kelly speculates that the state of Missouri is furthest along in studying this technology. Consequently, he predicts they’ll be the first to have a commercial hyperloop system up and running in the U.S.